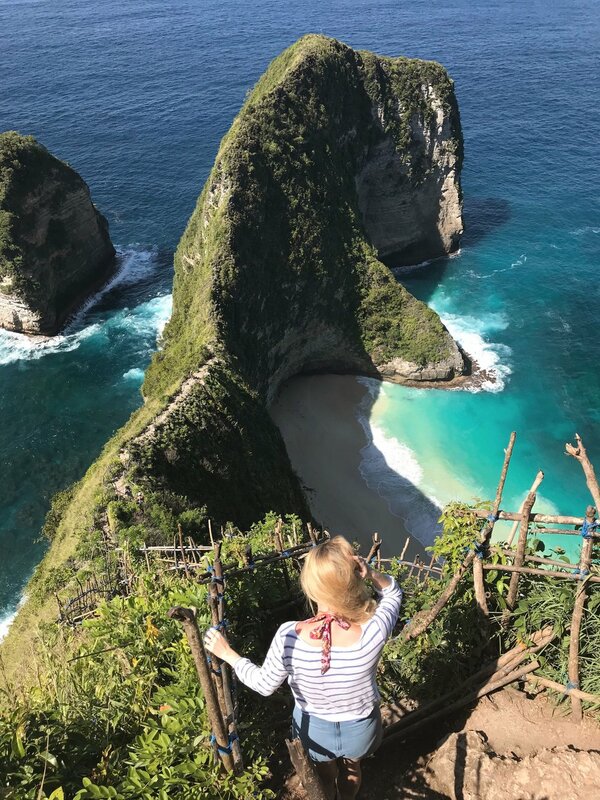 If you haven’t heard of Nusa Penida before, there’s a pretty good chance you would have seen the famous Kelingking beach shots doing the rounds on Instagram of late. I feel so so lucky to have made it there in real life. 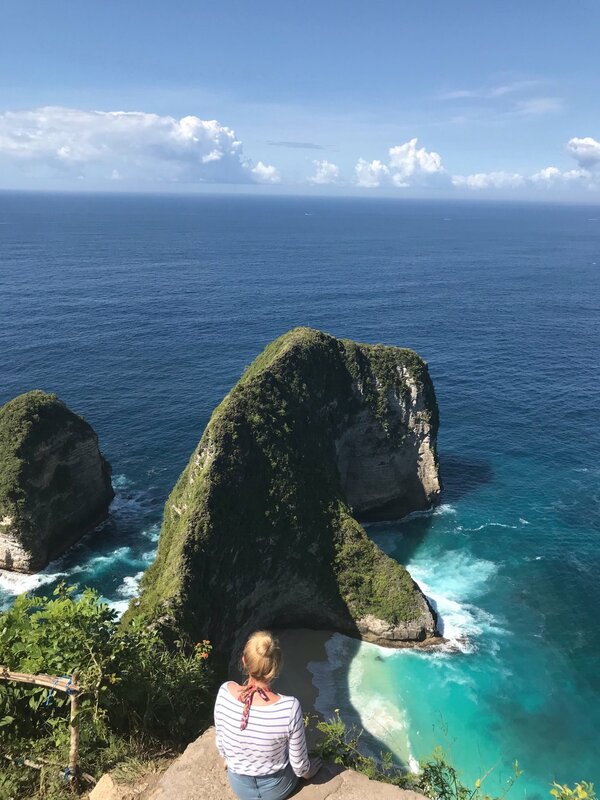 We visited Nusa Penida during our travels to Bali in February, and we almost didn’t get there as it was a bit of a mission to plan and organise (more on that in a mo), but I’m so glad we did. I cannot recommend a visit enough, should you ever be on neighbouring Bali. Not only is the landscape out of this world incredible, it’s one of those places that has yet to really be touched by mass tourism, and there’s a certain magic about the island. Nusa Penida is the largest of the three islands (Nusa Lembonghan and Nusa Ceningan) just off the coast of Bali. It’s hilly and green, and has spectacular diving, but as I mentioned before, there is very little tourist infrastructure, (most travellers stay on the neighbouring Nusa Lembonghan, which is what we did) or travel over for a day trip from Bali. There’s alot to see, but be warned, it’s a very long and hot day of being on the road, either on a motorbike or by car. We only managed the West side of the island, but got to visit the main viewpoints and beaches there in one day. There is so much to see! I wanted to put together a little Nusa Penida Blog post, featuring points of interest, so here’s a little taster of what we saw on our trip to Nusa Penida. This was the first place on our Nusa Penida list to visit, and as soon as we got off the little boat at the harbour, we were ready for the 40 minute plus drive up to the famous Tyrannosaurus Rex shaped coastline. When I say ready, I think Glenn was more so than me. I as usual, had my sensible/anxious pants on, but the adventurer in me was also itching to see what all the fuss was about, and I kept telling myself that opportunities to visit places off the beaten path like this, don’t come around that often. We hired a moped from one of the warung's on the dock for about 100,000 IDR (just over £5) after taking a local boat from Nusa Lembonghan. You can head on down to the little harbour area, just before the yellow bridge to pick up a boat. The cost was around 50,000 IDR (about £2.50) each one way to Nusa Penida from Lembonghan, and this is the local price for the boat. There are organised trips with tour operators that you can go on (some are listed at the bottom of the post) but these are obviously more expensive and we found choosing a tour tricky. Glenn is a pretty seasoned traveler with lots of experience driving and navigating, so we decided to do the tour independently. Mainly because of not being able to find anyone to take us on our chosen day, and the lovely guys at Palm Grove Villas, (which is where we stayed in Lembongan) told us that we could go on our own. We’d be pretty safe as long as we had a decent offline Maps App and took supplies like water and sunscreen. We use Maps ME on our trips. The first stretch of roads leading away from the hustle and bustle of the harbour area were smooth, but half way in they turned to dusty, pebbly roads, (mostly uphill) so it was an extremely hot and bumpy ride, but once we’d made it and got a first glimpse of that view, it was so worth the effort. We arrived early on the island, (I think we were there by about 9.30am) as we knew we wanted to beat the crowds, something I can highly recommend. (With Instagram posts, the place has been growing and growing in popularity). By the time we left at around 11am, it was packed with tours, so make this your first destimation of the day if you want to take some photos without too many people in them. There’s a small fee to pay once you get there (can’t remember the exact amount but something tiny like 50p each) and you can park up, have a wander along the clifftops and grab some food or a cold drink, from one of the local restaurants. (I had a rather lovely homemade pancake for breakfast, with chocolate sauce from a can...we were up at the crack of dawn!) Plus one of the workers there was singing and playing Zombie, by The Cranberries, (oddly enough it was just before Dolores passed away), so it was a pretty magical place to eat breakfast that morning. We then headed down to the main viewpoint to take some snaps of the famous shoreline. (We even spotted a Mantaray swimming down in the turqouise sea, which was pretty special). Further along, we discovered that you could actually get down into the sandy cove via the spine or the ridge of theT-rex, but it was a fair old hike down, with not much more than a make shift bamboo railing. (And a few signs telling us that there was danger on the rocks). We went about a quarter of the way down, which was far enough for me. The tide coming in and out down on the beach was insane! You wouldn’t want to get stuck down there, (although we were a bit jealous of the one person that was swimming down in the cove) but decided to take in the view from the steps instead, then climbed back up, once the tours started arriving. I have to say it was one of the most incredible pieces of shoreline I’ve ever seen. One of those untouched places that you see on a travel documentary, out of reach to the masses and so so serene, despite the rugged dinosaur like cliffs. (There were even pretty little orange and yellow flowers growing all the way along). After a couple of hours we decided to head off to the next stop on the Nusa Penida list, Angel’s Billabong. On arrival, (again we paid a small entrance fee, like most places in Indonesia) I have to say I was a bit disapponted, as on first look it kind of looked like any cliff’s edge, and I felt a bit dishearted as we’d come all that way (this was the rockiest, most bumpiest journey, from Kelingking down to Angel’s Billabong) and I kind of felt like I could have been anywhere! However about a ten minute venture down the path (to the left of the parking area), through some shady tree, we spotted the natural infinity pool, better known as Angel’s Billabong, and I started to see what all the fuss was about! The pool had the clearest water, a marine green colour, making it stand out against the deep blue of the ocean surround. Again because of our early start, we’d got here pretty early, so there were only a handful of other tourists taking in the sights. One other couple were already in the pool, so we waited for them to finish swimming, and Glenn ventured down the rocks and into the water. It’s a natural pool, so you sort of have work your way down from the rocks. There’s no manmade stairway or railings, and it’s a pretty steep walk down, so I stayed up halfway so I could get some photos, (the waves crashing in and out of the pool, put me off from going swimming, and there’d been reports of people getting sucked out to sea (I’m not the strongest swimmer) so decided to just take in the view from above. Glenn however loved the swimming (and got to cool off from the sweaty moped ride) plus we got some pretty cool videos to keep as a momento. After a brief ten minute stop up on the rocks to dry off and take in the scenery, we headed further round the path (to the left of Angel’s Billabong) and on towards our next stop, Broken Beach. For me Broken Beach was like something out of a movie scene. Glenn had wandered down towards the archway, while I carried on opposite so as I could capture a few photos. I kept just looking thinking how breathtakingly beautiful the scenery was. A perfect natural archway carved out into the rocks, the turquoise Indian Ocean below and luscious green landscapes, with nothing other than a few cows grazing. (The cows were on the archway at this point which somehow made the scene for me, you can also spot Glenn if you look closely). We were also so lucky with the weather and blue skies that day (the previous day had been rainy and grey) so I felt blessed to experience the place in the sunshine. (I'm not sure it would have felt so special, had it been raining). It was past midday at this point and the heat, had got unbearable so after a slow walk back down to get the bike, we stopped and caught our breath for 15 minutes, had some water and a loo break (this was one of the only ones we’d come across, so be prepared to rough it ladies) then it was back on the bike for the last stop of the day, Crystal Bay. Our final stop for the day was Crystal Bay, (about another 40 mins on the bike from Broken Beach, but nowhere near as rocky and bumpy), which was a bonus, after what felt like hours driving. It was lovely to finally feel some sand beneath my toes at the end as a reward too. My stand out point leading up to Crystal Bay had to be the palm tree road. (Not sure this is the real name of the road, but that's what I call it). I always get excited when I see loads of tall palm trees and I feel a million miles from home, but the sight of them always makes me smile. We had to stop and get some photos and we were quite lucky as there weren't many cars or bikes leading up to the beach, so again it was one of those movie moments that you just want to capture in your head forever. Once we’d parked up, a little walk down onto the sand and the place was heaving. You can’t help but spot the rocky island smack bang in the middle. We were lucky enough to grab the last two bean bags, shaded by an umbrella (a small fee again) but at this point it seemed hotter than ever, so we welcomed the shady rest spot for a couple of hours, alongside a cold beer to sit and watch the world go by. Crystal Bay boasts amazing diving and snorkelling, and there’s trips that you can take to swim with the famous Mola Mola fish, so there’s plenty of water activities to enjoy. The current here wasn’t quite as strong as what we’d seen previously on Nusa Penida, and it was the most crowded place that we’d seen throughout the day. It got to about 3.30pm, and after a huge day of sightseeing and riding around Nusa Penida we decided to head on back down to the harbour to catch a boat ride back to our home for the previous week, Nusa Lembonghan. We left the bike back at the warung for its owner, and paid another 50,000 IDR each for a local captain to take us back to Nusa Lembongan. (Much easier than coming out, we had to only wait 5 minutes, leaving Lembonghan it felt more like an hour). With the sun hanging low, it was a gorgeous boat ride back. (The local boats are small and fit about 15 people, although you could end up sharing the boat with some cows, or even a moped, like we did with ours!) but we were back within 20 minutes and it was amazing to see the famous yellow bridge coming into greet us, covered in the glow from the late afternoon sun. Our trip to Nusa Penida was most certainly one of the highlights in our whole Bali trip, and I'd love to return to explore some more one day. If you're planning on visiting then check out the links below for more information. I'd also love to hear from you if you've been, and if there's other places you can recommend that I might have missed. HOW TO GET THERE: We traveled to the island from Nusa Lembonghan, but you can also take a day trip from Bali, either from Sanur, Kusamba or Padang Bai in East Bali. COSTS: A tour can cost anything from 350,000 IDR (around £18)to 750,000 IDR (£39) per person. We paid around £25 for the day for a bike and boat transfers. 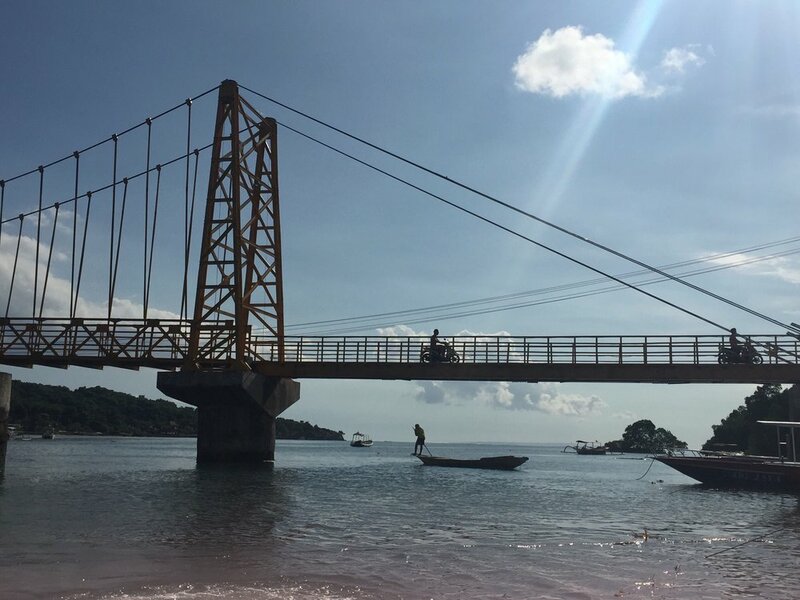 BEST TIME TO VISIT: We visited the island in February, at the end of the rainy season. January and February are generally the wettest months.